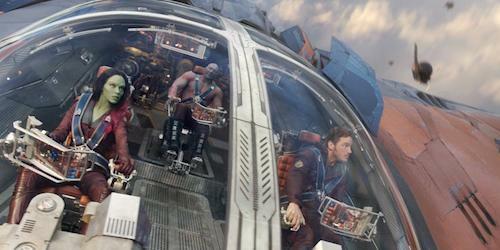 Synopsis: An action-packed, epic space adventure, Marvel’s Guardians of the Galaxy expands the Marvel Cinematic Universe into the cosmos, where brash adventurer Peter Quill finds himself the object of an unrelenting bounty hunt after stealing a mysterious orb coveted by Ronan, a powerful villain with ambitions that threaten the entire universe. To evade the ever-persistent Ronan, Quill is forced into an uneasy truce with a quartet of disparate misfits-Rocket, a gun-toting raccoon, Groot, a tree-like humanoid, the deadly and enigmatic Gamora and the revenge-driven Drax the Destroyer. But when Quill discovers the true power of the orb and the menace it poses to the cosmos, he must do his best to rally his ragtag rivals for a last, desperate stand-with the galaxy’s fate in the balance. After Thor: The Dark World burst onto the scene with its Dark Elves and Aether, you got the sense that Marvel Studios was building towards something bigger. Where the first set of Marvel films, commonly referred to as Phase One, built a world, this next chapter (Phase Two) seemed to be building a universe. Not just for new cinematic opportunities, mind you, but also for the introduction of obscure comic book characters. It is because of that universe-building that a film like Guardians of the Galaxy can exist, and thank god because it is fantastic. Set almost exclusively in either space or on foreign planets, Guardians of the Galaxy puts the spotlight on a ragtag group of misfits led by Peter Quill, a.k.a. Star-Lord (Chris Pratt from The LEGO Movie). Quill has made a name for himself as an interstellar antiquities dealer, picking up rare space artifacts and selling them at the highest price. However, when Star-Lord comes into possession of a mysterious orb – one that houses a power of immense destruction – he becomes a major target for the galaxy’s baddies. 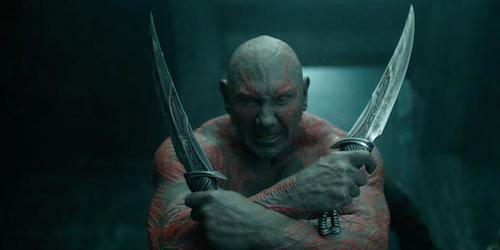 But a chance encounter with a vengeful alien named Drax (Dave Bautista), a psychopathic talking raccoon named Rocket (American Hustle‘s Bradley Cooper), a green assassin named Gamora (Zoe Saldana of Out of the Furnace), and a giant tree creature named Groot (Fast and Furious‘ Vin Diesel) helps Quill discover his calling as a hero, and gives rise to what will eventually become the group known as the Guardians of the Galaxy. While some may scoff at a film featuring a talking raccoon and tree, they should know that director James Gunn has delivered one of Marvel’s most enjoyable films to date. The way Guardians of the Galaxy balances comedy with action and peppers in some beautiful character moments is wholly impressive, and a reminder that bold sci-fi pictures don’t always have to be serious affairs. They can excite with frenetic action sequences, like Guardians of the Galaxy‘ mining ship chase through Knowhere, and then instantly pull out a gut-busting one-liner in the same breath. In fact, one could argue that balance between drama and humor is Marvel’s greatest strength, and nowhere is that more apparent than in Guardians of the Galaxy. 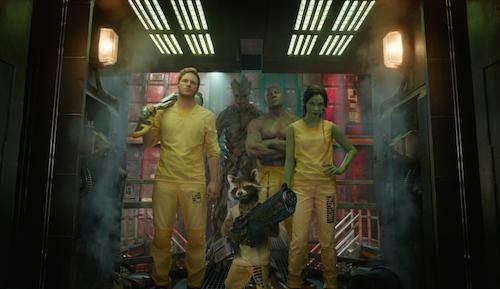 The cast, led by Pratt’s Star-Lord, is a pitch perfect blend of unique characters who only work as a team. Put any of these individual characters in their own film and it would likely fall apart, but put them together and the tree, the assassin, and the tattooed meathead sing. Even more than that, each character balances out the other; Star-Lord’s cocky frat boy finds his perfect counterpoint in the cutthroat Gamora, while Rocket’s sarcastic demeanor balances out Drax’s blunt attitude. And he may be a talking tree, but Groot steals the show in Guardians of the Galaxy – he’s funny, terrifying, and he has some of the most heartwarming moments. These five characters are endlessly entertaining to watch on screen, and are a testament to the fact that, in the right hands, any Marvel character, no matter how obscure, can work. In addition to the film’s irreverent humor and strong character work, Guardians of the Galaxy shows that Marvel has evolved their filmmaking skills since Iron Man in 2008. What once took the studio several movies to achieve – i.e. building up distinct personalities and then bringing them together – now only takes one. To introduce audiences to five characters and have them caring about each by the film’s end is no small feat, but Gunn makes it look almost effortless. Sure, there are a few clunky “here’s my backstory” moments, but because this world feels so rich, you’re compelled to learn all there is to know about Drax’s family or the genetic experiments performed on Rocket. In achieving that team-building goal, however, the film struggles to find time for its cast of side characters, specifically its villains. Ronan the Accuser (Lee Pace), for example, is menacing in both design and demeanor, but you never get a good sense as to his motivations. He’s simply evil because he looks the part. To be fair, some of the film’s side characters get plenty of screen time, most notably Michael Rooker’s Yondu, but as a whole, Guardians of the Galaxy has trouble balancing its main group with its villains and lesser heroes. But because the film has a clear focus on building the team, you tend not to care too much about how criminally underused someone like John C. Reilly or Glenn Close is. With only a handful of flaws, and most of them easy to overlook, Guardians of the Galaxy hits that playful space adventure note so perfectly it’s hard not to want to re-watch the film immediately. The spectacle, the character dynamics, the world building – it all makes for a universe you can’t wait to discover more about. And major props are due James Gunn and his talented cast for breathing life into these characters. Guardians of the Galaxy likely won’t reach the same heights as your favorite Marvel adventure, but it comes dangerously close. Much like the Iron Man 3 script, the Guardians of the Galaxy screenplay subverts expectation with biting humor. James Gunn and fellow screenwriter Nicole Perlman had a heady task ahead of them, but they succeed in building up these five unique characters and giving them each a handful of moments to shine. Again, it’s worth pointing out that the film’s secondary cast is underserved, but that feels like a length limitation more than anything else. There’s so much that needs to be accomplished in this first film and for the most part it comes out having achieved all it wanted to. On top of that, this film wears the big bold space adventure badge with honor, something that you rarely see in films these days. The scope and scale of the story is massive and the places it takes the audience are each more interesting than the next. To lean into the sci-fi this hard must have felt like a huge risk for Gunn and Marvel, but to their credit the film doesn’t hold back. You want a film with colorful aliens, massive space ships, world-destroying weapons, and sinister villains? Guardians of the Galaxy delivers. Although the action sequences in Guardians of the Galaxy are fun and inventive, they lack some of the energy that the rest of the film has. In some places it’s the editing and in others it’s the composition, but oftentimes the transitions from one shot to the next don’t match up. It’s not completely jarring, but it does get in the way of the pacing. Even so, the film has a bounty of sci-fi action filled with plenty of comedic touches. There are incredible space battles, intimate one-on-one fights, and even a little hijinks thrown in for good measure. And visually, this film is nothing short of stunning, from the design of Groot and Rocket to the staging of the climactic final battle.